conditions such as clay, will require a greater depth of granular and it is important to confirm this first. The aggregate surface is then paved with a minimum of 2 inches of asphalt (after compaction) to provide a durable surface. For a severely cracked, older driveway it requires that the old asphalt and faulty gravel base be completely removed. For driveway resurfacing, where minor cracks have appeared, a layer of asphalt over the original driveway is sufficient. With driveway paving you will receive what you pay for. 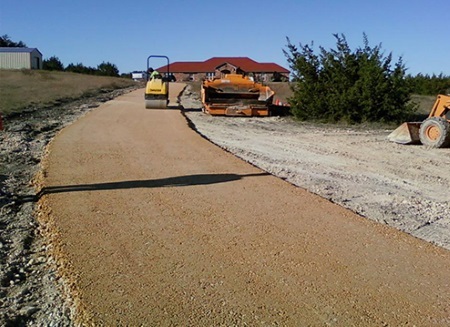 Paving is a major undertaking involving expensive supplies and equipment. A first class paving job includes proper preparation and should last at least 10 years with routine care. Give us a call at 719-210-1131 or use the handy form on the right to give us some details about your needs.